Any enterprise organization will invariably want to know how its SEO efforts are impacting the bottom line. Those inquiries usually follow a similar process. First, the management reviews how the overall search visibility is within the search engines. Then, they ask what ROI the rise in that visibility delivered. For an SEO, one of the most effective ways to establish and report on the above is by tracking keyword rankings. Rank tracking proves more and more challenging for many SEOs, and I can understand why. For one, the new SERP structure and its additional elements - universal search results, featured snippets, videos, ads and more - make it difficult to establish one true rank for a domain. SEO focus also shifted from targeting individual keywords to focusing on entire topics. While this is great for strategy and quality SEO work (long gone are words like “keyword density”), this presents a challenge to track success. Ultimately there are still keywords entered into a search engine and a list of sites - and you still want to be on top of that list. So, how do you track rankings today? How can an enterprise SEO monitor this KPI at scale without sounding like an SEO from 2008 obsessed with singular keywords? You’ll learn that from this post. Before we discuss how to track rankings for an enterprise site, let’s review the challenge more closely. The SERPs have evolved past the ten-blue links. 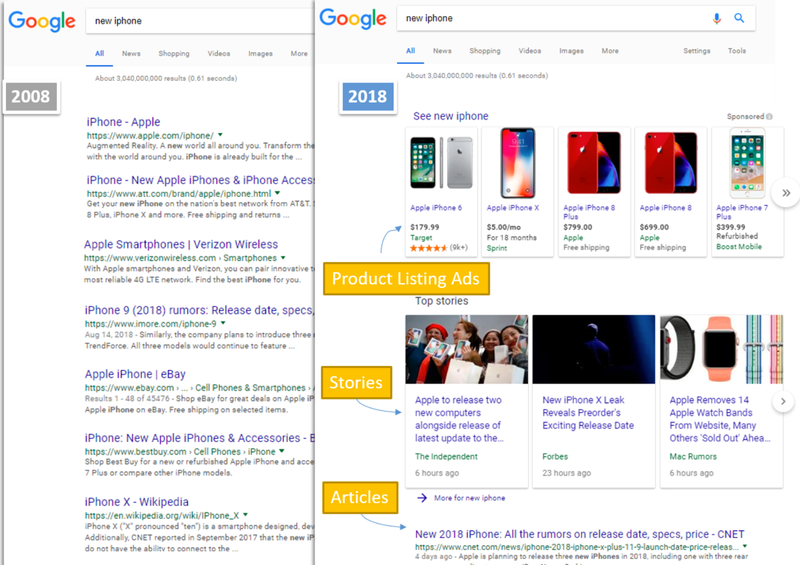 Universal Search Results, Featured Snippets, and new features from Google make it nuanced to track keyword rankings precisely as the different positions 1-10, really make a difference depending on what other search features are presented in the SERP. 10 Year Challenge: The SERP has evolved over time. SEO strategy moved to topics instead of keywords, complicating SEO rank tracking further. I think we can assume that there are an infinite number of keywords at play now. What’s more, with RankBrain, we should no longer think of Google making manual updates around each term but rather it being grouped together on topics that are improved via AI. 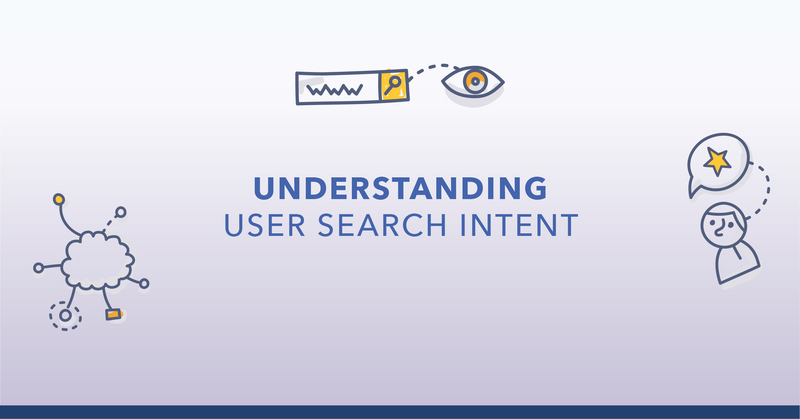 We can leave it to the search engine to understand the topic of the site and index the content for relevant queries. Consider the query: sales prediction techniques. None of the top listings include the key phrase I used; yet they deliver the exact information I was looking for. Another reason: Enterprise SEO teams must track global, multi-domain, and multi-location site rankings, and find a way to communicate the rank tracking data to various stakeholders like executives and category teams. On top of that, personalized search results display results based on IP address from the location in which you’re searching. It’s important for businesses to understand ranking based on location and not more general, national results. Finally, most enterprise SEOs must prove the positive return of their efforts – keyword rankings included - on the company’s goals and the bottom line. Before I show you how to overcome all those challenges, we need to make something clear. Why Is Rank Tracking so Important? Rankings are not the end goal of SEO, after all. Achieving the highest visibility of your content would be far more critical. Increasing conversions is even better. Driving more traffic from the search engines would also constitute a more critical objective. Rankings are what come right before it, however, to help you achieve something else. You can use them to prove the value of your work. Improving “rankings” means you’re heading in the right direction. Keep it up and the traffic will follow. What’s more, it’s a relatable SEO metric every stakeholder in the company will understand. The average American Googles three times a day. That helps understand viscerally what it means to “rank #1” vs “rank #75” for an important query. Higher visibility will always mean the potential for more clicks. And as we’ve proved in our SERP CTR study, improving rankings for keywords ranking on page one will result in significantly greater traffic. Pro Tip: Combining the two data – keyword rankings and CTR – to show the effect of better rankings will help you get buy-in for future initiatives, too. That’s because illustrating to various stakeholders the potential boost in traffic resulting from obtaining higher visibility is bound to bring people together on a project. To do the above, however, you must create an approach to keyword tracking that is a.) reliable and b.) connected to the SEO goals such as an increase in organic traffic and conversions. Here’s a system I recommend for it. Below is the process I recommend to our clients regularly. It’s also one that we’ve tested thoroughly. We know it can help you show the monetary value of SEO, too. The process consists of three stages. First, you determine the keyword set to track. Then, you review SEO performance over time. And finally, you build custom reports to notify various stakeholders of the data relevant to them. To report the value of SEO efforts, I recommend building a set consisting of three keyword groups. Group 1: Benchmark keywords featuring the top performing phrases. These keywords should form about 30% of the set. You can uncover them in Google Search Console by reviewing top queries going back one year. In seoClarity, use Search Analytics that brings all your Google Search Console data into the platform. To discover the most relevant phrases, remove brand-related keywords as well as any queries that reference your competition. 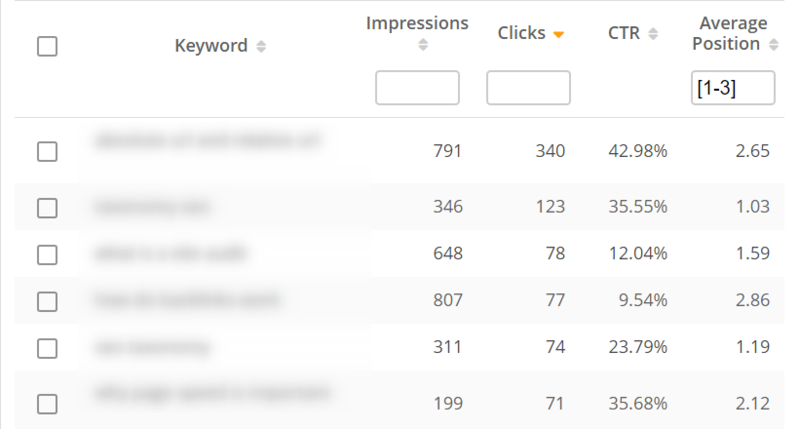 Finally, sort queries by the average clicks position , focusing on those in the top three positions. Export them to a CSV file for further processing. Search Analytics report showing non-branded terms in positions 1 – 3 that are driving traffic to the site. Repeat this process for terms in position 4-10 to create a subset of terms that are considered low-hanging fruit; they are close to being higher in the SERP. With a little work, these terms can help drive more clicks - a nice short-term goal and opportunity to show progress. Group 2: Optimize keywords your domain ranks for but too poorly to drive performance. These phrases should form another 30% of the set. Typically, these are phrases where you rank for positions 11-40. You uncover them by analyzing your domain in the Research Grid and applying relevant filters. Research Grid report showing keywords ranking on positions 11-40. Moving the needle on these terms will take time compared to terms from Group 1 that are close to ranking in the top three. Consider this a long-term opportunity for your content strategy. Group 3: Build keywords – These include phrases where your competitors already rank, but you do not and should form another 30% of the set. To identify those phrases, use Content Gaps, comparing the rankings between you and three or four competitors. When doing so, make sure to filter for results between positions 1 – 3 for your competitors. However, run two separate searches for your domain. In the first one, uncover the competitors’ top-performing keywords only, requesting only the phrases where they rank, but you don’t rank in the top 100 results. To be outside the top 100 but have your competitors there means you’re really missing something. Sometimes this is intentional (i.e. you don’t carry a particular product); other times it’s a super quick win. In the other, request phrases where you also rank but poorly (lower than position 40). These will show you terms where you’re relevant but you haven’t focused your efforts to rank. Set up regular ranking reports to analyze your keyword set. Any new initiatives and other efforts should affect the rankings over time. That, in turn, will help to justify the investment in SEO. Finally, combine ranking data with the goals to highlight the tangible effect of your efforts. It will also help guide conversations with stakeholders and the buy-in for new projects. I also recommend showing the impact of your efforts by comparing rank changes to initiatives on those pages – content updates, meta tags tests, additional schema, UX tests and so on. You can also tag these events and show the connection of your work to the overall growth. In seoClarity, use the “Events Tag” feature so show certain pages that are being worked on or are in a specific category. A word of caution: don’t obsess over reviewing your daily rank data. While it’s an excellent gauge for you and your team, you shouldn’t lose sleep over a ranking drop from position 3 to position 4. I suggest you instead review the data weekly and look at consistencies before you dig into what could be minor issues. As the final step, set up custom reports for unique teams – C-level executives, management and other stakeholders. Send them only the rankings and SEO data they care about and can act upon. There is a good reason for doing that versus creating a single report for everyone. You want those people to anticipate your ranking reports as they deliver the information they can use too. Before I go, let me share with you the most common mistakes I notice enterprise SEOs make over and over when tracking search engine rankings. I list them in no particular order because each has an equal effect on the SEO performance. Not thinking about mobile first. At the same time, mobile and desktop ranking experiences are different. Understanding mobile vs. desktop rankings and traffic helps define next steps in boosting search visibility better. Tracking branded terms or irrelevant phrases. I’ve outlined what to include in a keyword set to track instead. Not considering irrelevant/low transaction intent traffic and focusing on the transactional keywords only. Not taking a ‘long-view’ on rankings. If you only look at snapshots in your trended data, you miss out the bigger picture. Because a page could have been ranking well for one day while for the rest of the month, it performs poorly. Understanding patterns like this will shed more light on how to develop the strategy further. You don’t want to claim a ranking victory, not aware you slid back down the next day (when the stakeholder themselves can search it and see a different position). Celebrating too much. Rankings only really matter to SEOs. They should never become the end goal. Rank positions fluctuate beyond your control, after all. Similar to the point above, if you’re celebrating rankings, you risk the others perceiving your work on the whole as a failure when rankings suddenly slide. Tracking keyword rankings helps establish the value of SEO initiatives and gets buy-in for new ideas. However, to achieve this, an SEO must understand what rankings to track, and how to report on them to others. The above involves building a dedicated keyword set, including three groups of phrases - Benchmark, Optimize and Build (we call it the Bob Method). Remember also to identify goals to tie in with rankings using average organic click-through rates.